You are a frequent visitor to one or more venues for meetings etc., but have noticed serious issues with the way they handle your arrival, departure or some other aspect of your time with them. If this is the case, we’d be delighted if you would tell us about your experiences and point us in the right direction to help your hosts improve your experience through their deployment of new working practices supported by CABS. You are one of those people within the location with responsibility for the visitors’ experience and are keen to find a system that can help you provide the kind of service that your visitors deserve and that will enhance, rather than detract from, your organisation’s reputation. If you are a member of the second group, you’ve made a good decision. 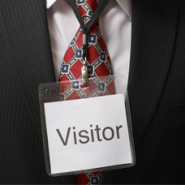 We believe that visitor handling is the visible tip of the client service iceberg. We understand how hard it is to provide top-class client service if the information you have at your fingertips and the system you rely on, are not up to muster. CABS provides a solid foundation of up to the moment information to all users, giving a living, breathing, single version of the truth through every contact point. From having the name of the host that the visitor is due to see, the room they will be meeting in, the expected arrival time, the personal catering preferences of each visitor, through to an on-screen word picture description and a simple location code to help you and colleagues recognise them in a busy foyer, a quick and simple way of keeping track of coats, umbrellas and luggage, to automatic host notification, and visitor check out facilities (supporting accurate emergency roll-call listings), CABS is a system you can rely on to help you shine. CABS also handles car park space allocation and tracking, security badges, and even personalised visitor badge printing. If this sounds like the kind of solution that could transform your world, contact us today to see how we might upgrade you to CABS pdq!